and the RZR S Project! After a few months of researching into the Polaris RZR's and trying to decide if I wanted the regular RZR, the RZR S, or the XP I thought I had my mind made up. So I went to Norris Supercycle ((931)498.2301) on 111 just out of Livingston to look at his inventory to see if it helped my decision. After looking at them all on his show room I decided that Dollar for Dollar the S model was the model for me. He didn't have a base S model but he had this Blue Fire/Orange LE that just looked amazing to say the least! When I drove this thing I was hooked! I know there is several bikes out now that have a lot more power than the 800 H.O. but I feel this is the bike for me and the way I ride. Needless to say after the deal was made and I took the Blue S LE for a spin I found Randell Norris (the owner of Norris Supercycle) standing by the trailer ready to help me load it up and I was smiling from ear to ear! Stay tuned to this build over the next few months as I will be "Making her Mine"! If you own an ATV or SidexSide and have ever rode at night I am sure you have found the stock headlights to be marginal at best. As I found the same I went to Baja Designs and Picked up 2 of their new Squadrons and 2 of their SII's for my RZR. Read More. Pro Armors Pro Am seats! KFI Products Stealth 4500lbs winch! I feel One of the most important accessories for a SideXSide is a good quality winch after all whats the chances of getting stuck in the woods? Pretty good huh? Or what if you are almost to the top of a big hill then you spin out? You then got two choices either back over the hill or just winch to the top. Read More. When it comes to offroading safety is number one and when it comes to safety in a sidexside a good quality set of harnesses is a must have. The stock seat belts are minimal at most and when you are riding offroad you just never know what is going to happen so trusting the stock seat belts is sometimes hard to do. Read More. 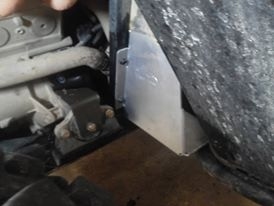 The 2" receiver hitch is the most common of the receivers and due to this the accessories for it can be found almost any where for a good price so when I seen the RZR did not have one from the factory I was a little bit disappointed. Read More. When on the trails I like to ride and ride hard so I don't like to have to worry about every little stick or rock and it seems No matter how careful you try to be there will be times when it seems that rock just comes out of nowhere and without proper protection carnage can happen in a number of ways! Over the past several years I have depended on Ricochet Offroad Armor to protect my equipment and with the RZR it is no different! Read More..
From the first time I looked at the RZR I felt the fender flares would take a lot of abuse and possibly get ripped off in the stock configuration so I went to UTV INC and Picked up a set of there nerf bars to add some much needed protection to the bike. Read More. The stock grill in the RZR is loose and real easy to remove so I was afraid in time I would loose it or a stick would go right through destroying it and possibly hurting the radiator so I went to EMP and picked up one of their Stainless steel Web Grills. Read More. Much like the front the rear of the RZR has very little to no protection and when in the woods you never know when a good friend might bump you from behind on accident or you might accidentally back into something on the trail causing expensive and undue damage to the bike. For this reason I went to UTV INC and Picked up one of there Rear Bumper/Cage Extension combo's! Read More. These bases from RacerTech are a steel construction for added strength as well as they are thinner to allow the seat to sit lower making a more comfortable ride plus they have the center cut out to allow for more seat travel on those big hits. Read More. Its no secret the RZR is designed light weight with a high power to weight ratio compared to some of the other SidexSides out and sometimes this is a good thing but depending on how you ride this is not always the case. Read More. It seems like any more you are always hearing stories of some ones bike getting stolen so I am always nervous when it comes time to spend an overnighter on a long weekend ride, especially when staying at a hotel when the bike will be out of sight and definitely not out of mine all night.. Well this product from Extreme Metal Products helps to ease my mine. Read More. EMP's Smack Back Buggy Mirrors for the RZR! These mirrors are awesome, Made from 3/16th steel and powder coated for durability they have a strong and durably frame that is coupled with a 5 1/2 fully adjustable convex mirror for maximum viewing area. Read More.